Doddington Chalk Pit is designated as a RIGS because it provides access to this particular interval within the Chalk; is particularly fossiliferous and contains the infrequently exposed Rochester Hardground. 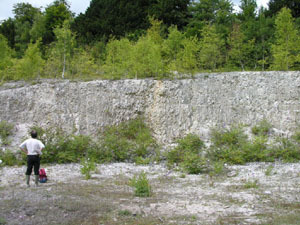 The site has good educational potential for study of its fossils and the higher part of the Kent chalk sequence. Doddington Chalk Pit lies on the dip slope of the Downs near Doddington village. This large, partly overgrown pit provides a magnificent section through part of the lower Upper Chalk (i.e. almost the entire upper half of the Coniacian Stage). 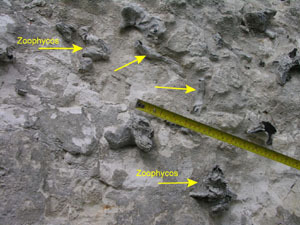 At the base of the section flinty, slightly nodular chalk, (Micraster cortestudinariumzone), provides excellent fossil collecting, an unusual occurrence in this zone. The upper part of the pit comprises flinty soft white chalks of the Micraster coranguinumzone and again these are very fossiliferous. Within the lower part of this zone the Rochester Hardground is well developed. This is a submarine mineralised erosion surface that represents a significant break in sedimentation. It indicates local tectonic activity in the Medway region during Chalk times. Its presence here demonstrates that uplift covered a larger area than was previously believed. Doddington Chalk Pit was surveyed for designation as a RIGS in August 2005. Access is relatively easy along a track from the road, parking in the quarry away from the industrial units. The quarry faces are near vertical and hence there is the risk of falling debris. It is uneven under foot.